Cleaning the gown shortly after use will facilitate stain removal. 1. Soak the gown in soap and water for an hour or so. Do this to soften and dissolve any drool or milk from the baby. I recommend “Powdered Tide Plus Bleach”. Do not confuse this with powdered Tide and you add bleach. One type of Tide has a color safe bleach within the product and is marketed as “Tide Plus Bleach”. I am not a big fan of Woolite®. Use warm water. Hand agitate three or four times for gentle cleaning. 2. Thoroughly rinse the gown. Put the gown inside a net bag, put the bag into your washer. Do not add soap. The gown has enough soap from the hour of soaking. Wash on a gentle cycle. To rinse by hand, change the water four times. 3. Avoid using chlorine bleach. 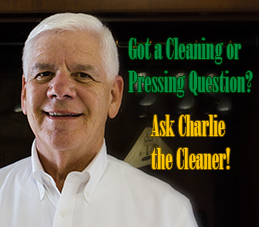 Chlorine bleach will degrade silk and may yellow synthetic fibers such as polyester. If you feel compelled to bleach, first try hydrogen peroxide. Flush thoroughly. If chlorine bleach is required: First mix the bleach 4 parts water, 1 part bleach Use a cotton swab to apply a small amount to the stained area. Rinse, Rinse, Rinse, Rinse! 5. Lightly steam press. Place in an acid free box. Sealed plastic boxes do not breathe. I prefer boxes designed to store christening gowns. Keep these instructions with the gown for the next person who uses the gown. This paper is acid free and lignin free. For family fun, make a chronological record on the back of this sheet about the use of the gown. 6. 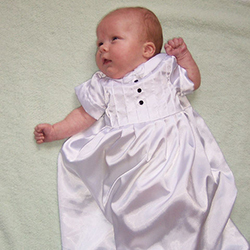 Store the christening gown in a cool, dry place. A good place is in the air conditioned part of the house in a closet or under a bed. Do not store in an attic, it is too hot. Do not store in a basement. A basement is too damp. Be careful of concrete floors and concrete walls that could have moisture and cause mildew.